This Coke cake recipe was contributed by Lee Avery Catts to "Atlanta Cooknotes" and was published by The Junior League of Atlanta. Preheat oven to 350 degrees. In a bowl, sift the sugar and flour. Add marshmallows. In a saucepan, mix the butter, oil, cocoa and Coca-Cola. Bring to a boil and pour over dry ingredients; blend well. Dissolve baking soda in buttermilk just before adding to batter along with eggs and vanilla extract, mixing well. Pour into a well-greased 9- by-13-inch pan and bake 35 to 45 minutes. Remove from oven and frost immediately. 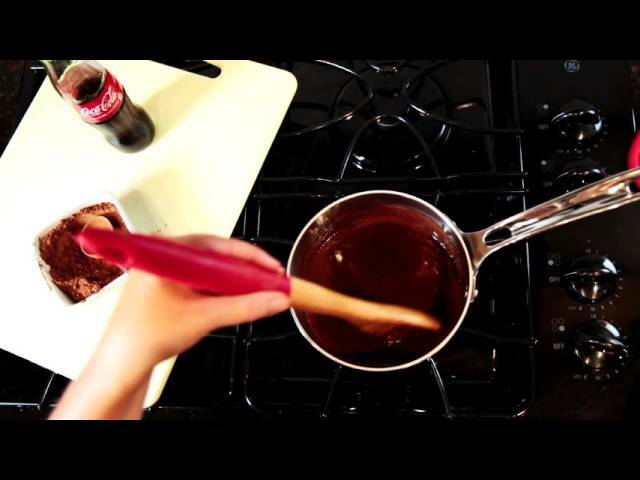 To make frosting, combine the 1/2 cup butter, 3 tablespoons cocoa and 6 tablespoons of Coca-Cola in a saucepan. Bring to a boil and pour over confectioners' sugar, blending well. Add vanilla extract and pecans. Spread over hot cake. When cool, cut into squares and serve.